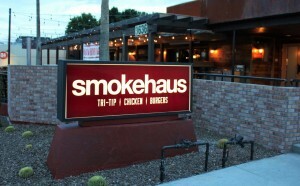 Local restaurateur, Dave Andrea, of Brat Haus, has big plans for his soon to open Smokehaus restaurant in Old Town Scottsdale. Located right next door to Brat Haus, Smokehaus will be the new home of a Camelback Smoker with a bit of local history. 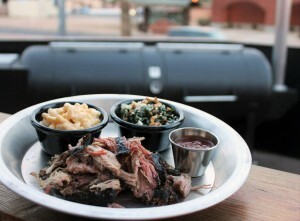 What was once designed and owned by Scott Holmes, founder of beloved local restaurant, Little Miss BBQ (LMBBQ), the Camelback Smoker will add a unique signature flavor to the SmokeHaus menu inspired by central California’s Santa Maria style grill. Holmes, who partnered with John Rippel of Camelback Smokers, designed this smoker to incorporate all of the updated features and new ideas he had from previous designs. Holmes thinks the Camelback Smoker might give Smokehaus some of LMBBQ’s good fortune. Unlike other smokers, the Camelback Smoker has a way to navigate airflow to allow for more customization above or below the meat. It also has three inches of insulation, making it fuel efficient. Plus, it looks really cool. Smokehaus’ claim to fame will be the Santa Maria Tri-Tip Sandwich, which is hand rubbed, cut thick and served on a grilled French roll. Other menu items include The Greasewood, a ½ pound beef patty topped with roasted green chili, and the 1984 Taco Salad, made with chopped romaine, seasoned ground beef, tomatoes, red beans, cheddar, fire roasted corn, avocado and corn chips all tossed in haus made Catalina dressing. Additional Smokehaus entrées include Smoked Tri Tip, Half Chicken, Pork Ribs, Pulled Pork and Salmon. Sides include Ranch Beans, Street Corn, Pork Belly Mac N’ Cheese and more. Customers can end their meal with dessert items such as the Texas Sheet Cake or an Ol’ Fashioned A&W Float. Smokehaus will open to the public beginning on February 1, 2016 and is located right next door to Brat Haus at 3636 N. Scottsdale Road, Scottsdale, AZ 85251. ← Previous Previous post: Devoured Culinary Classic Tickets Have Sold Out!